And a quick word on the garlic and ginger. I grate both using a microplane and a little goes a long way here. I have a tendency to go overboard when it comes to adding ingredients like garlic to dishes but I've found that you can use too much here so I would stick with the recommended amounts. You'll find that at the end of cooking, the grated garlic and ginger might be sitting at the bottom of the pan. Depending on how strong you want it, you can leave some or all of it in the pan since the garlic and ginger flavors have already permeated the sauce enough. 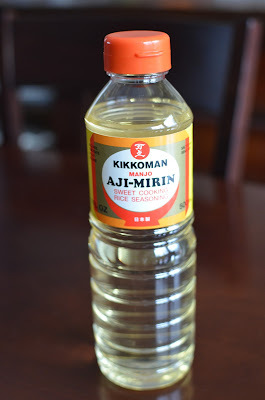 This teriyaki sauce is handy for stir-frying like I did with the chicken. When summer comes, it's great to whip some up for barbecues. Recently, I used it as a marinade and sauce for some stove-top pork chops that I cooked in a cast iron skillet. It's all good! And I'm going to confess something...my affinity for teriyaki sauce goes way back. Do you ever go to a Japanese restaurant and order a bento box? Well, I used to literally get a bento box with say, beef or salmon teriyaki, and I'd proceed to dip my sushi (yes, my California and/or spicy salmon rolls) in the teriyaki sauce! Apparently, regular soy sauce wasn't enough for me back then. I don't do that anymore - as tempting as it is - but I enjoyed every bite of it back when I did. That's my confession of the day. Make teriyaki sauce: Place soy sauce, water, mirin, brown sugar, and granulated sugar into a measuring cup. Heat in the microwave for 10 seconds, stir until sugar is dissolved (if necessary, pop it back in the microwave for another 5-10 seconds). Add garlic and ginger and stir together. Make chicken teriyaki: Place chicken thighs in a bowl and season it with some white or black pepper. Add 2 1/2 tablespoons of the teriyaki sauce (reserve the remainder) and the cornstarch, tossing to coat. Marinade at room temperature for about 20 minutes, or make it ahead and place in the refrigerator for several hours (remove from the refrigerator about 20 minutes before cooking). Heat a large non-stick skillet with the canola oil over medium-heat. Add chicken in a single layer, let cook without disturbing for about 2 minutes, to allow it to brown and caramelize. Stir and continue to saute until chicken is cooked, about 5 minutes or so. Add the remaining reserved teriyaki sauce to the pan, toss to thoroughly coat the chicken. Cook for about a minute to allow sauce to thicken slightly, then transfer to a serving plate. Top with sesame seeds and scallions, if using. Serve hot, with rice. * For a thicker teriyaki sauce, you can make a cornstarch slurry by combining 1 teaspoon of cornstarch with 2 teaspoons of cold water. Heat teriyaki sauce in a small saucepan, add cornstarch slurry and stir until thickened. So true, no one can say No to teriyaki sauce. And this chicken teriyaki looks and sounds divine, Monica. My husband would love this! Thanks, Anu. My fellas are big fans, as you can imagine. It's hard not to like teriyaki. haha I definitely really enjoy teriyaki sauce as well!! That had me chuckling about the sushi! I also tend to go a little overboard with the ginger ... it's a problem! :) This dish looks and sounds wonderful! Isn't it a magic sauce, Monica? These chicken bites look succulent and very flavourful. Totally - whoever came up with it was a genius. Oh yeah, I need to use it as a dressing now!! hehee - I'm glad you don't think that was too odd, Kelly! : ) I son loves teriyaki salmon at the Japanese restaurants and whatnot so it's good to make some at home. I've been working on a teriyaki sauce for some time now - your version sounds perfect! I can eat sushi with just about anything - but I haven't tried it with teriyaki - but I will :) Have a wonderful week Monica! haha - next time, give it a try and see if it grosses you out or if it's addicting, Tricia. ; ) I am happy with this little teriyaki recipe. My family really enjoys it and I make it now and then. I do love teriyaki sauce! The savory sweetness it has is something that I totally crave for! And this looks so delicious! I would finish this bowl of chicken in one go, Monica. It looks really great and the teriayki sauce sounds totally delectable too. haha - I hear you! I love teriyaki chicken but have been too lazy to make it myself. I just might put this on next week's menu - thanks for the inspiration! Glad to be of help, Eva! I just had teriyaki chicken last night for dinner! Wish I saw this first - looks so scrumptious! That's awesome! : ) Enjoy the upcoming weekend, Ashley. A great recipe for a tasty midweek dinner, this looks so good. You've made me hungry! sounds delicious, monica! teriyaki sauce is a favorite of mine, and i appreciate your sharing a wonderful homemade version for all of us to try (: have a great weekend! Great teriaki recipe. I've never made the sauce myself, I always bought it, but this is so simple and I'm sure healthier and tastier. I can't wait to try it! I hope you try it and enjoy it like we do, Adina..thanks. Sounds great - hope you make it and enjoy it like we have. So glad to hear that. Thanks for letting me know! Have a great weekend! Glad to know it...love Japanese food and making teriyaki tonight!